Having a plan and a system in place before you begin the home buying process can help you avoid many of these common traps, which will not only save you money but will put the odds in your favor to get the best house for your needs. 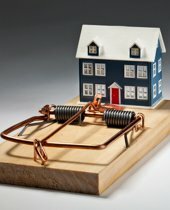 These eight tips will help you identify some of the most common and costly traps when buying a home and what you can do to steer clear of them. Making Offers Without Knowing The True Value – The million dollar question when making an offer on a home is what price you should offer on the home once you find it? While there is no perfect answer to this question, you need to know if the seller’s price is too high, just right, or if it is priced below market value. Without knowing the facts and researching what other comparable homes in the neighborhood and area are selling for, you are guessing at what may or may not be a reasonable offer. Without this knowledge, you could easily pay too much or make an offer that is too low and miss out on the home of your dreams. Not Getting Financing Preapproval – Before you talk to a lender, you should check your credit report to get your credit score. Knowing your credit score may give you some leverage to getting a lower rate if your score is high enough. Getting preapproved for a mortgage is free and easy. In fact, most of the time it can be done online. Preapproval gives you peace of mind knowing that when you find the home of your dreams, the money will be there. It will also save you time since you will only be looking at homes you can afford rather than homes that are out of your price range. Plus, it will put you in a stronger negotiating position over a buyer that has not been preapproved. Buying The Wrong House – What exactly are you looking for in a home? This question sounds simple enough, but the answer can be rather complex. There has been more than one homebuyer that has gotten caught up in the excitement and emotion of buying a home only to realize the house they bought did not meet their needs and desires. Perhaps it was too small, or maybe the commute was longer than desired, or there were more repairs to be done than they realized. Take some time before you even begin looking at homes to define what you want and need in your home. Not Considering Hidden Costs – For most homebuyers, the first step in the process of buying a home is saving the money for a down payment. Although the down payment is normally the largest expense, there are several hidden costs or costs you may not consider, associated with buying a home. Some of these fees may include appraisal fees, home and pest inspection fees, closing costs, and moving expenses. Ask your lender for a breakdown of the fees associated with your loan. Learn the costs involved in advance so you can plan ahead for any unexpected expenses that may come up while under contract or even after the sale. Looking For The Perfect Home – This is a common trap, especially for first-time homebuyers, because there is no such thing as the perfect home. This is why it is so important to make a list of what you want in your home and location. Once you have your list, break it down into a must-have list. The goal is to find a home with everything you need, and as many of the items that you want as possible. You also must be realistic so set your priorities in advance and understand that a certain amount of flexibility may be required. Equating A Foreclosure Or Short Sale With A Good Deal – When the housing market crashed, foreclosures and short sales flooded the housing market and there were plenty of good deals to be had. But just because the home is a foreclosure or short sale does not automatically make it a good purchase. These terms have become synonymous with a good deal, but that is very often not the case. There are many factors other than price to take into consideration when considering buying a foreclosed or short sale property. Submitting A Lowball Offer – Every Homebuyer wants to get the most house for the lowest price possible, but there is a difference between submitting an offer that is on the low end of market value and submitting an offer well below what the house is actually worth. By submitting a lowball offer, homebuyers run the risk of the seller simply rejecting their offer outright, or worse, losing out on the home to another buyer. By knowing the approximate value of the home, you can make a reasonable offer based on the true market value range. Not Using A REALTOR® – While it is possible to buy a home without the services of a real estate agent, it may not be the easiest and most effective way to go about the process. First of all, agents have access to all the properties that are active on the market through MLS (Multiple Listing Service), as well as what is under contract and what has sold. A real estate agent can schedule the showings, create a comparative market analysis to determine the true value of the home, write offers, and handle many of the activities involved in buying a house. Having a professional look out for your best interests is the best way to ensure a smooth home purchase and in most cases costs the buyer nothing since the seller normally pays all broker fees. Hiring a professional that knows and understands the market, contracts, has experience negotiating, and can guide you through the entire home buying process is the best way to avoid these, as well as any other buyer traps.